Welcome to the Crazy Castle! Listen, Doc, it's up to you to guide me, Bugs Bunny, through the castle and rescue Honey Bunny. But don't think it's going to be easy! Those rascals Daffy Duck, Sylvester, Wiley Coyote, and Yosemite Sam have captured Honey Bunny and hidden her deep within the castle. Along the way we have to collect all the carrots while avoiding those rascals. OK, Doc, let's get going! --From the NES Bugs Bunny Crazy Castle instruction manual. 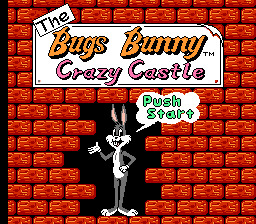 Play Bugs Bunny Crazy Castle Now!